Courts in southern Kyrgyzstan have sentenced two ethnic Uzbeks to life in prison following unfair trials on charges related to the June 2010 inter-ethnic violence in the region, Human Rights Watch said yesterday. The verdicts follow many earlier flawed investigations and trials of ethnic Uzbeks linked to the June 2010 events. On October 25, 2012, the Osh Province Court sentenced 33-year-old Mahamad Bizurukov, an ethnic Uzbek and a Russian citizen, to life in prison. The court overturned a September 26 verdict by the Kara Suu District Court that sentenced him to seven years in prison on charges of “unlawful deprivation of freedom,” but acquitted him of murder charges. On appeal, judges found Bizurukov guilty on both counts and ruled that he also must pay approximately US$5,300 in compensation to the family of Almaz Askarov, the man he was accused of killing. In a separate hearing in Jalalabad region, also on October 25, the Suzak District Court sentenced Shamshidin Niyazaliev, 31, an ethnic Uzbek who is a Russian national, to life in prison in another case related to the June 2010 violence. He was sentenced after an unfair trial on multiple charges including murder, participation in mass unrest, and robbery. Large scale inter-ethnic violence erupted in Osh, in southern Kyrgyzstan, on June 10, 2010. Over the next four days violence spread to other cities in the south, killing 400 people and destroying close to 2,000 houses. Horrific, violent crimes were committed against both ethnic Kyrgyz and Uzbeks, and ethnic Uzbeks endured the majority of casualties and destroyed homes. Criminal investigations have been marred by widespread arbitrary arrests and ill-treatment, including torture. Profoundly flawed investigations and trials, mainly affecting the ethnic Uzbek minority, undermine reconciliation efforts. Bizurukov was arrested in June 2011 and charged with “unlawful deprivation of freedom” for his alleged connection to the death in June 2010 of Askarov, an ethnic Kyrgyz. Bizurukov alleged that police operatives tortured him to confess. His lawyer submitted a complaint to the Osh regional prosecutor’s office, but the prosecutor refused to investigate his allegations. Bizurukov’s father was also arrested in the case and died in the Osh pretrial detention facility on September 1, 2011, a few days before the trial was scheduled to start. The prosecutor’s office brought criminal negligence charges against the doctor at the temporary detention facility for that death. A verdict is expected early in the week of October 29. Violence broke out in the courtrooms during both Bizurukov’s trial and appeal hearings. Bizurukov’s lawyers told Human Rights Watch that during proceedings, Askarov’s relatives insulted and physically attacked parties to the trial, including the defendant, his lawyers, a witness, and even a judge. On September 26, after the Kara Suu District court issued its verdict, female relatives charged the cage in the courtroom holding Bizurukov, causing the metal grating above his head to fall, leaving him with a serious head injury. One of Bizurukov’s lawyers told Human Rights Watch that despite the severity of the wound, court officials did not call an ambulance, and Bizurukov received medical attention only an hour or so later at the temporary detention facility. Fearful of possible violence at the appeals hearing, Bizurukov’s lawyers had asked the court to provide extra security. Only a handful of police officers were stationed in the courtroom, though. To his credit, the judge ordered relatives to be quiet when they interrupted closing defense arguments. Bizurukov’s lawyer filed a complaint about the attack on Bizukurov with the prosecutor’s office. But judicial authorities have taken no steps to hold Askarov’s relatives accountable for the violence, either on September 26 or at earlier hearings. Under Kyrgyzstan’s Criminal Code, obstructing justice is a crime punishable by up to two years in prison, and disrespecting the court is punishable by a heavy fine and up to a year of correctional labor. Kyrgyzstan’s authorities should investigate the attack on Bizurukov on September 26 and hold the attackers accountable, Human Rights Watch said. In the second recent case, Niyazaliev was detained by Kazakhstan’s National Security Committee officers on the Uzbekistan-Kazakhstan border in January. 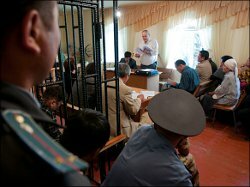 He was extradited to Kyrgyzstan in June to stand trial in connection with violence in the Suzak district in June 2010. Prosecutors allege that residents of the district blocked the Bishkek-Osh highway near the Sanpa cotton factory on June 12 and 13, poured fuel oil on the road to slow vehicles, and attacked drivers and passengers. The investigation said that 16 people were killed and two others are missing as a result. In 2011, 18 other people were sentenced to life in prison on charges related to this violence, and one defendant to 25 years in prison. Niyazaliev’s lawyers told Human Rights Watch that their client did not get a fair hearing and that the judge ignored exculpatory evidence. The lawyers said they presented documentation to the court showing that Niyazaliev was living in Ferghana city, in neighboring Uzbekistan, from late May to late June 2010. Fifteen witnesses testified they had seen Niyazaliev in Uzbekistan on June 12,the day the crimes he was accused of committing were alleged to have taken place in Kyrgyzstan, the lawyers said. Despite the evidence, the court found Niyazaliev guilty on all charges and sentenced him to life in prison. His lawyers plan to appeal. “It is very hard to see how Niyazaliev could receive a fair trial in the climate of fear and intimidation that prevails in southern Kyrgyzstan to this day,” Williamson said.